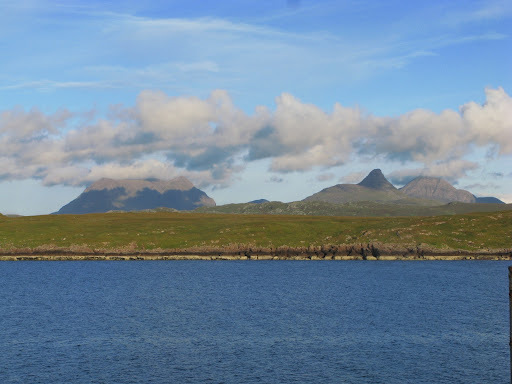 Today I headed off again from Scoraig, to begin my journey north, and follow the original route up to Cape Wrath. It was a beautiful calm morning on the Loch, so after saying goodbye, I walked down to the pier on Scoraig to get my kayak ready to paddle back across to the van. Here's the view from the shore this morning.. It didn't take long to paddle across, although again, the wind did pick up a bit on the way across. I soon made it to the jetty on the other side though. 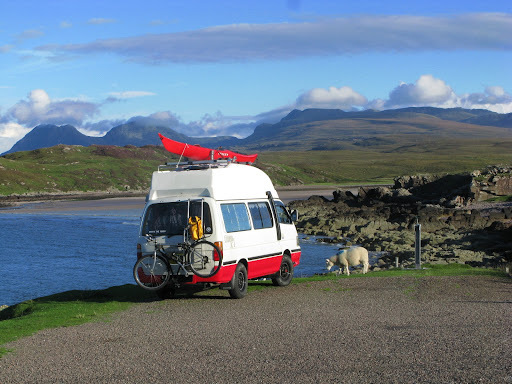 Once I'd made it across, and got the boat up onto the harbour, I took a shower in the van, and had a cup of tea. 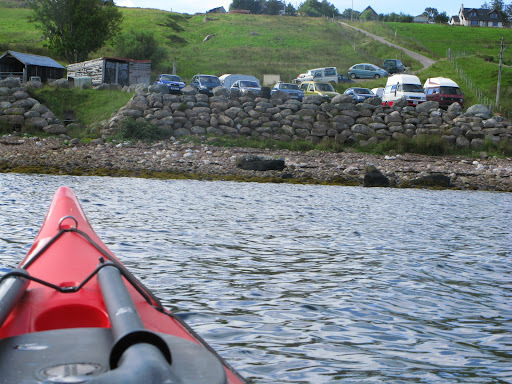 Then I loaded up the kayak onto the roof, and headed off, driving north to Ullapool. 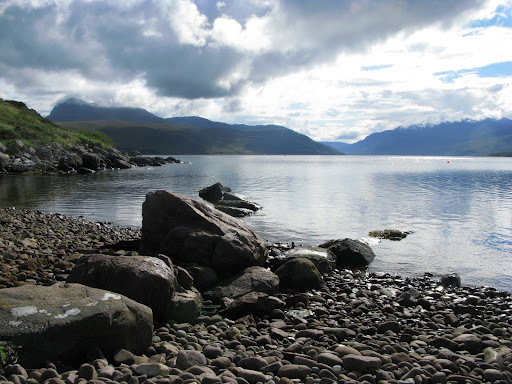 At Ullapool, I had some fish 'n chips, and chatted on Skype to a friend for a while, before stocking up on groceries. 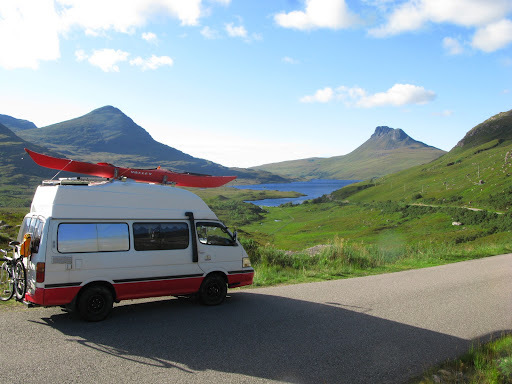 I then headed north again – breaking new ground, as I'd been to Ullapool before, only previously I'd left it on a ferry to Stornoway. About ten miles along the road, I turned off to the west, and followed the road along the shores of Loch Lurgainn. I passed the impressive mountains of Cul Beag, and Stac Pollaidh, an incredibly scenic journey. I didn't plan on covering too much ground today as I had decided to really take my time to reach the far north. I was heading for a place called Achnahaird, where I knew there was a sizeable beach – this seemed like a good possible place to spend the night. Sure enough, I found a really good place to stay tonight just by the beach, and even spent a little time fishing from the rocks before having dinner. Watching the sun go down over the distant mountains to the north gave me a lonely feeling – I am truly out here alone in the world again, so I am keeping focused to keep my spirits up. I've been listening to the radio and preparing dinner – chicken curry, and I think later I'll watch a film on my laptop before settling down for the night.